Automotive Composites Market size was worth over USD 15 billion in 2016 and its demand is projected to cross 4000 kilo tons in 2024. Increasing usage of lightweight materials with implementation of cost effective measures to reduce carbon emission are the key factors driving the automotive composites market size. This product offers superior strength to weight ratio and improves fuel efficiency of the vehicle. Shifting trends towards cost effective alternatives, sturdy and light weight components will positively influence the product penetration. Advancement in the production facilities focusing on decreasing the manufacturing time and capital cost are offering new opportunities to the industry players. Development of electric & hybrid vehicles offering long travel distance owing to reduced weight will further support the market growth. Stringent protocols to significantly reduce carbon emissions are positively influencing implementation of lightweight materials in vehicles. Besides, increasing global vehicle production with focus on improving the vehicle efficiency will fuel the market demand. Higher set up cost required for the manufacturing may affect the product penetration. Carbon fiber are difficult to repair particularly for the vehicle exteriors. Damage of the product during accidents requiring replacement of the part may affect the automotive composites market share. 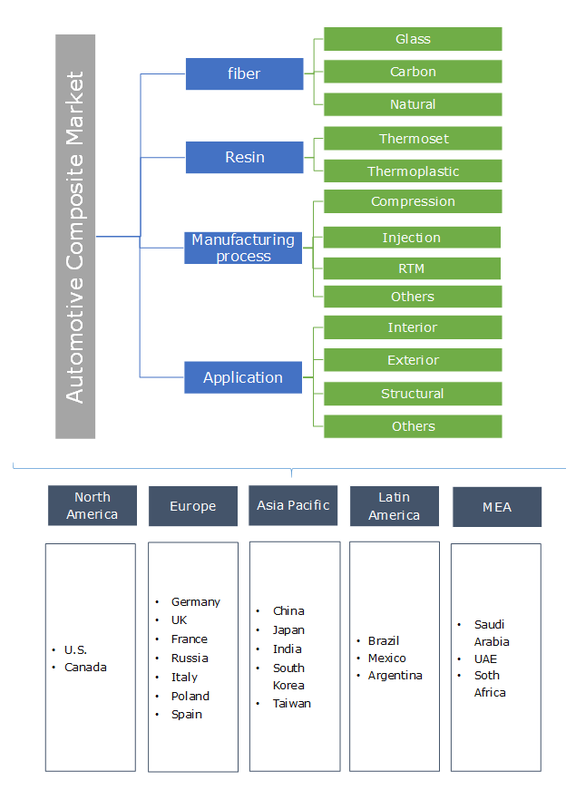 Industry players are focusing on increasing the production capacity and thus reducing the overall cost making it affordable and thus increasing the automotive composites penetration. Glass fiber holds the major volume share of over 70% in 2016 owing to cost effective solution compared to carbon fiber. Low manufacturing cost along with strong applications outlook in structural, exterior and powertrain will positively influence the industry demand. Carbon fiber will depict a strong growth of over 10% up to 2024. Strong weight reduction potential along with reducing the carbon foot print are the key drivers for the product growth. Manufacturers are focusing on reducing the price of the product with development of less expensive precursor materials. Natural fiber will witness significant growth during the forecast time frame. Positive application outlook in the vehicle interior replacing glass fiber and comparatively smaller footprint will fuel the business demand. However, low impact resistance and moisture degradation may hamper the product penetration. Thermoset dominates the automotive composites market share accounting over 60% in 2016. The product offers excellent electrical properties, superior chemical and moisture resistance, and long shelf life. In addition, the product offers excellent finish and adhesion further supporting the automotive composites industry demand. Thermoplastic will witness robust growth during the forecast timeframe. Faster moulding time along with easy recycling of the product will fuel the market size. Manufacturers are adopting the product for mass production in vehicle exterior. For instance, BMW launched i3 with thermoplastic exterior skin in 2014. Compression moulding demand was valued over 6 billion in 2016 and will witness significant growth during the forecast timeline. The growth can be attributed to increasing investment in reducing the cycle time of the process. Moreover, ease in manufacturing along with competitive price of the process compared to other counterparts will propel the market size. Injection moulding will witness rapid growth of over 7% during the forecast timeframe. Superior finish obtained from the process coupled with usage for mass production will support the market growth. RTM will witness strong growth during the forecast timeframe owing to increasing technological advancement to reduce number of parts required offering low cost and high-speed process. Automotive composites manufacturers are developing automated solution boosting the mass production of large sized vehicle components. Interior segment accounted over 800 kilo tons owing to increasing adoption of natural and glass fiber. Positive product outlook owing to superior finish product and sleek design will further fuel the automotive composites industry demand. Exterior segment leads the automotive composite market share contributing over 35% in 2016. Stringent government regulations focusing on carbon emissions and decreasing the overall weight of the product will fuel the business demand. Structural and powertrain will witness rapid growth over 7% up to 2024. 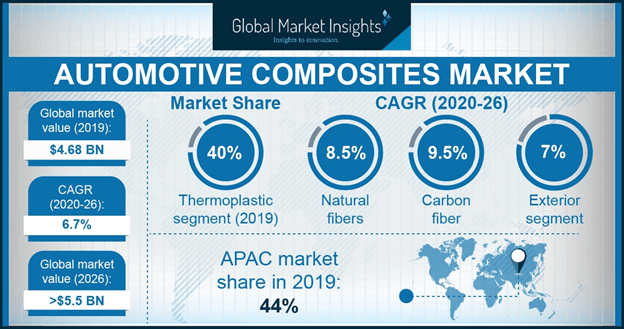 Usage of carbon and glass fiber particularly in structural components such as body panels, cross members and chassis will fuel the automotive composites market size. Moreover, industry participants are increasing penetration of the lightweight materials in vehicles further supporting the industry growth. North America will witness significant growth during over 6% up to 2024. Strong potential outlook in interior, structural and exterior applications will fuel the industry demand. Besides, innovations in vehicle manufacturing will implementation of light weight component will further support the market growth. Europe led by Germany, Italy, France and Russia will show noteworthy growth during the study time frame. Stringent government regulations focusing on reducing the overall vehicles weight and carbon emissions with implementation of advanced materials will fuel the industry demand. Increasing R&D coupled with presence of large manufacturers in the region will further support the market size. Asia Pacific led by China, Japan, India, South Korea and Australia will witness strong growth over 7% up to 2024. Large presence of manufacturers in the region with implementation of advanced materials in the vehicles will support the automotive composites industry growth. Moreover, manufacturers in the region are focusing on increasing the production capacity sufficing the growing demand. ACP, Cytec Solvay Group, Hexcel Corporation, Johns Manville Corporation, Koninklijke Ten Cate, Owens Corning Corp. Protech are among major industry participants included in the value chain of the product. Other key automotive composites manufacturers include SGL Group, Teijin Limited, Toho Tenax America, Toray Industries, Zoltek Carbon Fiber. Automotive composites industry participants are focusing on increasing the manufacturing capacity and implementation of automation in the resin processing. Additionally, decrease in overall price of the product will support the automotive composites industry demand. Composites demand arise from various industry sectors includes aerospace, sports and goods industry are increasing competitiveness of the product. Superior heat resistance and offering enhanced efficiency are the key factors for positive product penetration. Automotive composites penetration is boosting owing to shifting vehicle manufacturers preference towards higher yield and cost-effective solutions. Moreover, focus primarily on reducing the overall weight of vehicle will support the industry demand. Manufacturers are focusing on reducing the recycling issues of carbon fiber composites.